For family fun in the Turkish sun and plenty of action, make sure a trip to Club Exelsior Junior is high up on your list. 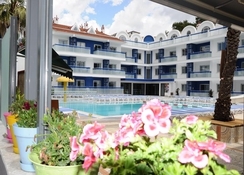 The hotel features a lovely pool which has a packed calendar of events, parties and pool games to enjoy. Set on the gorgeous Dalaman coast, for sun and beach lovers you simply cannot go wrong and with the centre of Maramris a short walk away you have your pick of resort activties, restaurants and bars to explore. The neighbouring Club Excelsior also hosts live shows and Turkish barbecue nights too. 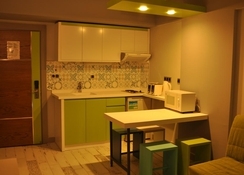 The one-bedroom apartments come with self-catering options and are fitted with kitchenettes. Children get their own separate pool, which features a large waterslide. A great level of service means waiters will serve you drinks and snacks as you lounge by the pool. Walk just 10 minutes to reach the centre of Marmaris, and a little further ahead you'll find a dramatic stretch of volcanic sand to explore. Club Exelsior Junior underwent a full makeover in summer 2016 so you'll find clean and contemporary rooms to enjoy here. 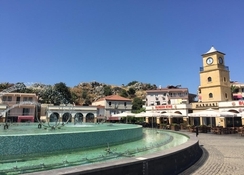 The centre of Marmaris, about 10 minutes away on foot, offers several options for shopping, plus bars and restaurants. The resort offers 75 one-bedroom apartments, across four floors, including twin rooms with kitchenette, lounge and balcony. You can opt for self-catering or upgrade to half board. Get your drinks and snacks served by the poolside as you relax on loungers. Check out the main restaurant and bar too, for international cuisine and a selection of drinks and cocktails. 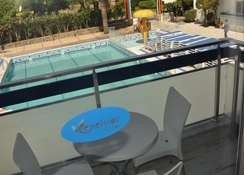 There are lots of activities to look forward to all day and night at Exelsior Junior, it has its own nightclub Aquirablue, if you want to dance all night. The outdoor pool, which has a slide as well, hosts several parties and games. There is also a baby pool with its own little slide. Or visit Gameland inside the complex, with toddler-sized rides and a ball pit. 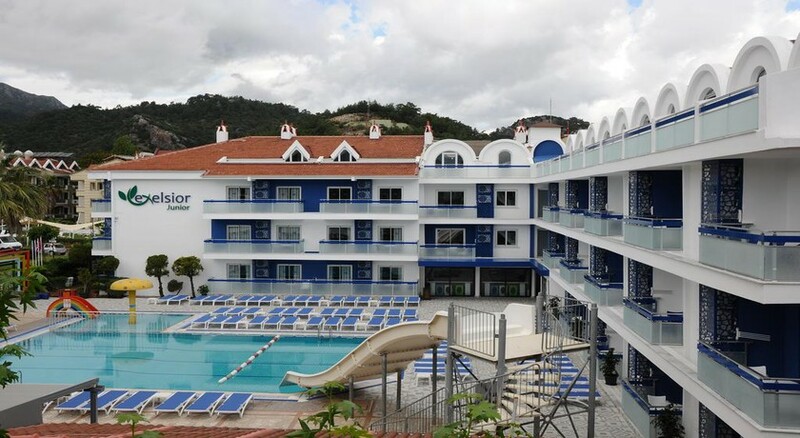 Drop in at Club Excelsior next door for live bands, pool parties and Turkish barbecue nights. Walk 10 minutes or take the bus to reach the bustling centre of Marmaris, where you can explore the fascinating bazaar and walk to Long Beach’s beautiful marina. Kids can have fun at their own club, with video games, PlayStation, electronic darts and table football. There’s also a basketball court and football pitch. No capacity for extra beds in the room. Dalaman Airport is 95 km. Milas-Bodrum Airport is 132 km.